This ESDN Quarterly Report (QR) focuses on sustainability impact assessments (SIAs) in Europe. Generally speaking, impact assessments (IAs) address governance challenges like informed (or knowledge-based) decision-making, policy integration, improved strategic management, transparency and stakeholder participation. The growing acceptance of sustainable development (SD) as an overarching guiding principle for policy-making stimulated the use of IAs in order to evaluate the impacts of (cross-)sectoral policies regarding SD. This QR will first provide a definition and overview of different IA approaches. Second, it will describe the integrated IA method developed and applied by the European Commission. Finally, two case studies on Switzerland and Belgium will show how IAs are applied to national policy-making. Over the last years, one can witness an ever increasing interest in impact assessments (IAs). On the one hand, this development is driven, for instance, by concerns for better and informed policy-making, like the “better regulation” agenda of the EU, involving issues like increased effectiveness and efficiency in legislation, more transparency and better policy delivery (European Commission, 2005a; European Commission, 2001). On the other hand, the growing acceptance of SD as an overarching guiding principle for policy-making stimulated the use of IAs in order to evaluate the impacts of (cross-)sectoral policies regarding SD (Bond et al, 2001). Although many different forms of IAs have been developed and applied in recent years, the following definition is general enough to cover most of them: An IA is an ex-ante evaluation of the potential impacts of projects, plans, programmes or policies. It mostly involves several systematic steps, including an identification and description of the problem, the definition of policy options and measures, an evaluation/assessment of potential effects and impacts, and the description of options available to mitigate theses effects and impacts. Therefore, an IA is a tool for informed decision-making that should help policy-makers to assess potential effects of decisions before they are taken (Ecologic et al, 2007; Renda, 2006; Wilkinson, 2004). There are many forms of IAs and no single, widely accepted approach can be detected. Starting in the 1970s, IAs were mostly used as regulatory policy appraisal in order to understand the nature of regulations and their usefulness as policy instrument as well as their impacts on businesses. These early forms developed into what is now referred to as Regulatory Impact Assessments (RIA). They are the most common form of IA in the OECD countries. RIAs often involve environmental and social issues but their main objective is the evaluation of the costs and benefits for businesses and citizens in complying with proposed regulations. Recent examples of RIAs can be found in Ireland where in 2005 a “Report on the Introduction of Regulatory Impact Analysis” (Department of the Taoiseach, 2005) was published. A second example can be found in the UK, where in 2007 a new format for IA (previously RIA) was introduced. An IA Guidance document provides background information on practical application. Over the years, different forms of sectoral IAs have been developed, like Business Impact Assessment, Social Impact Assessment or Health Impact Assessment (Paredis et al, 2006). Methodologically, a variety of methods is used, ranging from cost-benefit analysis, multi-criteria analysis, different forms of macro- and micro-economic models, etc. Usually, quantitative assessment methods are supported by qualitative methods. In the field of environmental policy, two forms of IA have developed during the 1980s and 1990s which are seen by many as first steps towards an SIA: Environmental Impact Assessments (EIA) and Strategic Environmental Assessments (SEA). EIAs largely developed in the 1980s, although their origin can be traced back to the late 1960s. In the United States, the National Environmental Policy Act of 1969 established an EIA process in order to analyse the environmental impacts of proposed projects. In the EU, EIA was introduced with a directive in 1985 which was amended in 1997. The EU Member States had to translate this directive into national legislation until 1999. The EIA Directive outlines which projects shall be made subject to an EIA, which procedure shall be followed and the content of the assessment. The EIA procedure makes sure that environmental effects of projects are identified and assessed before a decision is taken. The public can voice opinions during the assessment procedure. During the 1990s, there was much discussion within the EU to apply EIA not only to projects, but also to plans and programmes. In 2001, the SEA Directive was adopted for this purpose. It includes procedures that identify and assess environmental consequences of certain plans and programmes during their preparation and before a decision is taken. Again, public participation is foreseen in the SEA process. Over the years, SEAs have sometimes been used for assessing also the environmental impacts of policies and, in some cases, socio-economic aspects have been included (Dalal-Clayton & Sadler, 2004). Apart from recent developments in SEAs, all major IAs were focussed on specific policy sectors. The integration of their individual results had to be made in the final decision-making stage. Since the late 1990s, the call for an integrated IA became prevalent, especially in the context of increasing efforts for policy integration. Within the EU, the Cardiff Process in 1998 established the requirement for a better integration of environmental considerations in all policy sectors. The process towards the EU Sustainable Development Strategy (EU SDS), starting in Gothenburg in 2001, and the Lisbon Agenda both reiterated the objective to integrate economic, social and environmental policies. For instance, the renewed EU SDS suggests that all EU institutions (and EU Member States) “should ensure that major policy decisions are based on proposals that have undergone high quality IA” (European Council, 2006, para 11). In most European countries, strategic policy management in the form of National Sustainable Development Strategies (NSDSs) became increasingly important over the last years. By definition, NSDSs seek to integrate the three pillars of SD and also foresee measures to evaluate the implementation of the strategy objectives (see the ESDN homepage for basic information on NSDSs). These developments have paved the way for the development of SIA as integrated assessment tool. Compared to sectoral IAs, all three dimensions of SD are integrated into one assessment procedure and the interdependency of the three policy fields is analysed before decisions are taken. Therefore, an SIA can be defined as a “systematic and iterative process for the ex-ante assessment of the likely economic, social and environmental impacts of policies, plans, programmes and strategic projects, which is undertaken during the preparation of them and where the stakeholders concerned participate pro-actively. The main aim is to improve the performance of the strategies by enhancing positive effects, mitigating negative ones and avoiding that negative impacts are transferred to future generations” (Arbter, 2003, 1). The definition deliberately refers to plans and strategies because SIAs are particularly relevant for assessing the implementation of NSDSs. Some European countries explicitly refer to the development and/or application of SIA in their NSDSs (e.g. Belgium, Finland, Switzerland, etc). Transparency: making the decision-making process more open and transparent, identifying underlying assumption, motivations, interests, etc. Efficiency: ensuring that objectives of policies, plans, programmes and projects are met at the least costs, avoiding unnecessary bureaucracy, etc. As the table shows, the subjects of assessment or levels of application are different. SIAs are the most comprehensive ones and include strategies, policies, plans, programmes and projects. The frame of reference is also different: EIAs and SEAs have a sectoral focus on environmental policy, however, SIAs are related to strategic policy planning in the form of NSDSs and/or similar SD policy frameworks. Accordingly, the scope of assessment of EIAs and SEAs is narrowed to one policy field, whereas SIAs are focused on SD policy integration. Finally, there is extensive experience with the practical application of EIAs and SEAs, but less experience with integrated IAs on the EU level and SIAs in a few European countries. Generally, as Pope (2003) points out, integrated SIAs should be more than the sum of sectoral economic, social and environmental issues. This creates a number of questions regarding institutional and methodological issues. In terms of institutional issues, Dalal-Clayton & Sadler (2004) argue that this refers to the establishment of appropriate provisions and arrangements for SIAs within policy-making and planning processes. Therefore, SIAs should be made a “fundamental component of the decision-making process” (Pope, 2003, 8). Buselich (2002, summary) points out that, in practice, the most critical issue of SIA is “how environmental, social and economic information is analyzed, integrated and presented to decision-makers”. Methodologically, SIAs also present new challenges. If SIAs are to integrate different policy issues into one assessment process, procedural and organisational provisions (which ministry is responsible, which other ministries and stakeholders will be included) as well as interdisciplinary approaches (acknowledging that single disciplinary approaches will not suffice) will need to be developed (Bond et al, 2001). The European Commission already funded various research projects in order to gain insights into different methodologies for SIA (Tamborra, 2005). A current example is the MATISSE project, funded by the 6th Framework Programme for Research of the EU, which aims to advance scientific knowledge about and improve tools for integrated sustainability assessment (ISA). It is oriented towards supporting the development of cross-sectoral policies that address SD and at exploring enabling policy regimes and institutional arrangements (Weaver & Rotmans, 2006). When searching on the internet about SIAs in the EU, the first information provided is about Trade Sustainability Impact Assessment, mostly referred to as SIA within the EU. The Trade SIA was launched in 1999 in anticipation of the new World Trade Organisation (WTO) round of negotiations. Since then, they are carried out for all the EU’s major trade negotiations. A Trade SIA seeks to identify the potential economic, social and environmental impacts of a trade agreement and has two main purposes: (1) to integrate sustainability into trade policy by informing negotiators of the possible social, environmental and economic consequences of a trade agreement; and (2) to make information on the potential impacts available to all actors (NGOs, aid donors, parliaments, business etc.). During a recent Trade SIA stock-tacking conference in March 2006, a new handbook by DG Trade was presented (European Commission, 2006). However, the general framework for integrated IA in the EU is the European Commission’s IA system which was launched in 2002 (European Commission, 2002a). The basis for developing an IA has to be seen in the context of the “better regulation” objective which has been strategically included in the White Paper on Governance (European Commission, 2001). A follow-up to the White Paper, the Commission’s “Better Regulation Action Plan” (European Commission, 2002b), based on the 2001 Laeken Council Conclusions (European Council, 2001a) formulated objectives for all EU institutions in order to improve the quality of policy proposals, simplifying legislation, providing more transparency, etc. In this context, it also stressed the need for “a consolidated and proportionate instrument for assessing the impact of […] legislative and policy initiatives” (European Commission, 2002b, 7). Furthermore, “better regulation” became one of the milestones for achieving the Lisbon Strategy goals (European Commission, 2005b). The other driver for the IA was the development of the EU SDS (IEEP, 2004). The 2001 Gothenburg European Council Conclusions called in the section on the EU SDS for the introduction of “mechanisms to ensure that all major policy proposals include a sustainability impact assessment covering their potential economic, social and environmental consequences” (European Council, 2001b, 5). The Council thus acknowledged the need for integrated IA in order to assess the SD impacts of policy proposals. The renewed EU SDS which was adopted by the European Council in June 2006, reiterates the need for an integrated IA (European Council, 2006, para 11). In June 2002, a European Commission communication launched the new integrated IA in order to improve the quality and coherence of the policy development process. It is argued that the IA should contribute to “an effective and efficient regulatory environment and further, to a more coherent implementation of the European Strategy for SD” (European Commission, 2002a, 2). This confirms that the “better regulation” agenda and the EU SDS were the main political drivers for the Commission’s IA. identify trade-offs in achieving competing objectives. Since the update of the IA in 2005 (European Commission, 2005c), a formal IA is required for items on the Commission’s Work Programme. This means that all regulatory proposals, Whiter Papers, expenditure programmes and negotiating guidelines for international agreements are subject to an IA. Exempted are only Green Papers and proposals for consultation with social partners. The major change with the 2002 communication was that the IA would ultimately “integrate, reinforce, streamline and replace all the existing separate impact assessment mechanisms for Commission proposals” (European Commission, 2002a, 3). Therefore, an integrated IA approach was chosen which builds on the experience of, but finally replaces, sectoral IAs (e.g. EIA, business IA, health IA, gender mainstreaming, etc.). Integration and balance: IA should consider the economic, social and environmental dimensions of Commission policy proposals. In contrast to (budgetary) ex-ante evaluation which are primarily focused on cost-effectiveness, IA is policy driven, examining whether the impacts of policy proposals are sustainable and conform to the principles of “better regulation”. Transparency: It should be made clear to all stakeholders and the general public how the Commission assesses the expected impacts of its legislation, including the data and methodology used. A special website of the European Commission provides information on all IAs carried out. Furthermore, stakeholders and experts should be consulted throughout the IA process. “Proportionate analysis”: The assessment of impacts should concentrate on those that are likely to be the most significant or will lead to important distributive effects. IA is a process of systematic analysis of the likely impacts of interventions by public authorities. Therefore, IA should be made an integral part of designing policy proposals and making decision-makers and the public aware of potential impacts. IA is an aid to decision-making, not a substitute for political judgement: IA provides an input to informed decision-making, however, does not present easy-to-follow descriptions or recommendations. IA is an effective and valuable communication tool: Consultation with stakeholders may generate useful discussion and bring valuable information and analysis. In general, the IA outlined above is only a requirement within the European Commission and not in the EU Member States. However, the 2004 Staff Working Paper (European Commission, 2004, 4) argues that “to be fully efficient, the IA practice will need to be complemented, where necessary, by equivalent practices in the Member States”. This should apply in those areas where they use the right of initiative for new legislation (Justice and Home Affairs) as well as for the transposition of EU Directives that leave the Member States broad margins for implementation (European Commission, 2002a). Since 2005, a two-stage process for IA exists in the European Commission, consisting of a “roadmap” and an “impact assessment”. “Roadmaps” (previously known as “preliminary assessment”) are requested by the Commission services for the initiatives they have put forward for the Work Programme. Through this, information about initiatives is distributed early on and a brief statement is included about the likely impacts of policy options (also comprising availability of data, time and consultation plan, etc). Based on the roadmaps, the Commission will decide whether an “impact assessment” (previously known as “extended impact assessment”) is necessary for a policy proposal (Ecologic et al, 2007). It is the responsibility of the respective DG to carry out an IA for its policy proposals in cooperation with other Commission services affected. For individual IAs that cut across the responsibility of several DGs, Inter-Service Steering Groups are created, headed by the lead DG. The Secretariat General coordinates the basic support structure for IAs in the Commission. In 2006, the Impact Assessment Board (IAB) was established to ensure more consistent and high quality IAs. It is chaired by Alexander Italianer (Deputy Secretay General) and is under the direct authority of the Commission President. The IAB not only provides advice to the Commission services on methodology and approach at the early stages of an IA, its mandate is to also scrutinize and issue opinions on the quality of individual draft IAs. Carrying out the IA analysis. Submission to the College of Commissioners. Final IA report, published on European Commission website. What issiue/problem is the policy proposal expected to tackle? What main objective is the policy proposal supposed to achieve? What are the main policy options available to achieve the objective? What are the positive and negative economic, social and environmental impacts expected from the different options identified? How can the options be compared? What possible monitoring and evaluation arrangements can be applied for the policy? The analysis of the potential positive and negative economic, social and environmental impacts of policy proposals (question 4) are in the centre of the IA. The IA Guidelines (European Commission, 2005c) suggest a three step analysis: The first step is to identify those impacts that are likely to occur as a consequence of implementing a policy. This analysis should build on a causal model which links the causes (action, instrument, etc) to the effects (impacts). The second step is the identification of the most significant impacts. Again, the causal model is suggested as is a qualitative process of description (likelihood, magnitude of each impact) or an impact matrix (action according to their short-, medium- and long-term impacts). The third and last step is the advanced analysis of impacts which can be qualitative (e.g. case studies, scenario approach) or quantitative (based on indicators) or a combination of both. From 2003 until June 2007 (at the time of writing this QR), the Commission services carried out 248 IAs. The table bellows shows the total number of IAs carried out per year and the DGs with the highest number of IAs in the respective year (ranked 1st, 2nd and 3rd). * The IAs for 2007 are listed until 14 June 2007 only (latest update on the EC homepage at the time of writing this QR). DG Environment and DG Transport have carried out the most IAs between 2003 and June 2007 (35 IAs each). A good example of a recently completed IA is the one on the “Communication on Airport Capacity” by DG Transport in which for each optional measure, the economic, social and environmental impacts are listed in a table. In early 2006, the European Commission launched an independent evaluation of its IA. The objective is to review the experiences made since 2002, including how the IAs are carried out and used by the Commission services, their quality and their role in the policy or legislative process. The evaluation included a wide-ranging consultation process involving stakeholders, EU institutions and Member States. The final report will soon be published on the Commission’s governance website. Already in 2004, the Institute for European Environmental Policy (IEEP) released a report on how SD considerations have been addressed in the extended IA that were carried out in 2003, the first year of IA. They came to the following conclusions (IEEP, 2004): First, the analysis of the policy problems to be addressed tend to reflect the perspective of the responsible DG which suggests that inter-service consultation should be strengthened. Second, the range of impacts assessed is limited. Little explicit attention is given to SD issues or the trade-offs between the different SD pillars. Most attention is given go economic impacts with little treatment of environmental and social impacts. Third, the majority of impacts is discussed in qualitative terms. Only occasionally are there attempts to quantify long-term environmental or social issues. Therefore, an infrastructure for more extensive data collection and analysis in the IA system is suggested. Unclear purpose: It is not always clear what exact purpose the IAs have. Achievement of balanced policy integration (SD), “better regulation” or orientation towards the new Lisbon objectives which seem to focus on competitiveness rather than on integration? Resources and “proportionality”: IA Guidelines leave too much discretion to DGs; temptation to leave out difficult, long-term environmental and social impacts. Stakeholder representation: Stakeholders are included too late in the policy process when options are already determined. Earlier involvement and financial support for NGOs would benefit IA results. Credibility: The link between IAs and the final policy decisions should be made clear. Transparency about how IAs influenced policy decision. The Network of European Environment and SD Advisory Councils (EEAC) issued in April 2006 a Statement of its working group on governance about the achievements and prospects of the IA of the European Commission (EEAC, 2006). The statement is based on the analysis of four IAs and concentrates on the quality of the assessment process rather than on the overall outcome. Several problems and shortcomings of the IA were identified, e.g. not enough consideration of environmental issues; NGOs and environmental experts were less involved than business representatives; concentration on short-term impacts and qualitative analyses (e.g. cost-benefits analysis); lack of capacities in DGs for carrying our IAs; and the potential for deliberation, social learning and innovation was not exploited. These results seem to suggest that there is room for improvement of the Commission’s IA system. In this context, it will be interesting to see which conclusions are drawn from the independent evaluation launched by the Commission itself. As pointed out above, the EU encourages Member States to also introduce IA approaches. A recent study by Ecologic et al. (2007, 20) shows, however, that information on IA systems in the Member States is “patchy and sometimes contradictory”. It is further argued in the study that the contradictions are due to the fact that IA practice in the Member States varies strongly and, thus, the categorisation of procedures and measures is often a matter of interpretation. Different findings show that IA processes are complex and it is, therefore, difficult to categorise them in a comparable manner. In a Communication from the Commission about better regulation, a summary of various IA activities in the Member States is provided (European Commission, 2005a, Annex). Additionally, a recent study for the Austrian Federal Ministry of Agriculture, Forestry, Environment and Water Management (Arbter, 2005) provides an overview of IA activities in Europe which include SD issues. For the purpose of this Quarterly Report, the definition of SIAs given in the introduction is important in how the two SIA country case studies in Switzerland and Belgium have been selected: SIAs refer to policies, programmes, plans and projects and not only to laws; they are mainly based on NSDS or similar national SD policy frameworks and – most importantly – they are, like the IA of the European Commission, policy driven and focus on examining the impacts of policy proposals in terms of SD and the principles of better regulation. The Swiss NSDS of 2002 provides in Measure 22 a provision to investigate the feasibility of a sustainability assessment (SA). The aim is to “develop a tool that can be used to evaluate the effects of draft legislation, concepts and projects in terms of the three dimensions of SD and to indicate potential deficiencies” (Swiss Federal Council, 2002, 35). In other words, an SA is intended to evaluate initiatives and programmes put forward by the Swiss Federal Government with regard to SD objectives, to highlight shortcomings and to optimize the initiatives and programmes in question. The objective is to integrate SD in the development of policies, strategies, programmes and concepts of the Swiss Government. Currently, there is no legal obligation to carry out an SA for government initiatives and programmes in Switzerland. However, a phase of practical testing was introduced with a Federal Council resolution in 2003. The aim is to refine SA as an ex-ante evaluation instrument and to look further into procedural and institutional issues. In 2004, the Federal Office for Spatial Planning (ARE) developed a concept and methodological foundation for this process on the national level (ARE, 2004). A decision whether SA will become mandatory will be taken after practical experiences have been evaluated. Transparency is regarded as fundamental element at each stage of the SA process. The federal agency (e.g. ministry) that put forward an initiative or programme is in charge of carrying out the SA. This agency is also responsible for the level of involvement of other ministries and stakeholders. ARE may take part in SAs as an advisory body, ensuring consistent application of the SA method throughout the Federal Government. Impacts concern areas which already show severe SD problems and may increase in the face of new developments. Step 2: Establishing SD relevance. Step 4: Conducting the analyis. Step 7: Presentation of results. The graph below summarizes the Swiss SA procedure. The conceptual and methodological framework by ARE was tested in two pilot applications between 2004-06: the “Sectoral Transport Plan” and the “Agriculture Policy 2011”. Below is a short description of the SA of the “Sectoral Transport Plan”. Further information on the SA for the “Agriculture Policy 2011” can be found in Wachter, 2005. “Sectoral plans” are the most important spatial planning guidance documents of the Swiss Federal Government. With these plans, the government sets out the planning policies for specific fields, identifies the objectives and how they should be implemented. The Sectoral Transport Plan is the central instrument for transport infrastructure planning on the national level. In order to accommodate this plan with the goals of SD, an SA for the programme section of the plan was undertaken between 2004-06 (ARE, 2006). The SA was carried out by an external team of experts. In order to optimize the sectoral plan with regard to SD, the SA started very early and in parallel to the development of the plan. In total, five different versions of the programme section of the sectoral plan were part of the SA between August 2004 and April 2006. The SA focused on the objectives of infrastructure policy, the development strategies, the basic principles and priorities in specific parts of the plan and modalities of implementation (Wachter, 2006). To what extent does the plan comply with the goals of SD and what contradictions can be detected? Is the plan’s design balanced and comprehensive in terms of the three SD dimensions? To what extent are the defined goals and strategies consistent with the implementation measures? To what extent have specification been included which guarantee that SD goals are taken into account in future planning steps? Flexible application of SA in order to keep costs low. The idea to introduce an SIA in federal policy-making has been maturing for some years in Belgium. SIA was explicitly mentioned for the first time in the Coalition Agreement of the Belgium Government in 1999. A reference to the development of an SIA methodology was also included in the first NSDS (2000-04). The most important legal document on which recent efforts to introduce SIA is based is the Royal Decree of 22 September 2004. This decree not only defines SIA, but also established the “Cells for SD” (responsible for the implementation and follow-up of the current NSDS of 2004 in all public services) and laid out competencies and responsibilities concerning the introduction of a federal SIA process. In 2006, a manual for SIA was produced on the basis of the results of a study about the methodology and feasibility of SIAs (Paredis et al, 2006) as well as of the experiences of the Flemish region’s Regulation Impact Assessment. The application of an extended SIA. The Federal Planning Service Sustainable Development (PODDO) supports the federal government in the implementation of the SIAs. For this purpose, PODDO has set up a helpdesk that provides administrations with practical information on the SIA manual. Additionally, PODDO is responsible for monitoring the quality of the SIAs. SIA in Belgium is considered as a learning process with the ultimate goal to better and more systematically integrate SD in the preparation of policy proposals by the federal government. Given that SIA has the purpose to evaluate economic, social and environmental effects of policies before decisions are taken, it should also streamline and integrate other assessment methods. However, a number of evaluation methods will remain outside the SIA, mainly because of their specific character or position in the policy and regulatory process, like the Kafka test (to avoid administrative burdens), the advice of the Inspectorate of the Budget and the budget agreement. The responsibility for carrying out an SIA lies with the individual ministries that propose a policy. As mentioned above, assistance is provided by PODDO. This stage is to determine whether an SIA for a policy proposal needs to be carried out. A screening matrix for a quick-scan is provided in the manual. An SIA is only necessary if the proposed policy has potentially significant economic, social or environmental impacts in the short- to long-term. For proposals that are unlikely to have negative impacts, no SIA needs to be carried out. The scoping stage should clarify the content, depth and method of the SIA in order to make the exercise proportional to the potential impacts and a focus on the most significant effects is possible. At this stage, the potential impacts of the proposed policy and eventual alternative measures are assessed. The final step is the formulation of possible accompanying measures to avoid or reduce undesired impacts of the policy proposal and to foster the desired impacts as much as possible. As part of the study about on methodology and feasibility of SIA (Paredis et al, 2006), three case studies were undertaken by the research team. The first two case studies (on introducing ethical criteria in public purchasing and a policy proposal for the use of biomass fuels in transportation) set out to test all phases of the Belgium SIA approach. The third case study tested exclusively the screening methodology. A short description of the first two case studies is provided below. An extensive coverage of the case studies can be found in Paredis et al, 2006. A European Directive (2004/17/EC) on the coordination of procedures for the award of public works contracts, public supply contracts and public service contracts needed to be introduced into national law. The new law had the aim to also include the possibility to introduce ethical criteria in public contracts. The proposal for introducing this law in Belgium was used as a test case for SIA by the research team. Although it was decided very early in the SIA process that the test case would only include a screening phase, some important general conclusions about the application of IA could be drawn (Paredis et al, 2006). First, the test case demonstrated that in an ex-ante assessment, the identification of potential impacts of a policy proposal is a very sensitive issue. If no hard facts and data are available, the discussion of potential impacts can easily turn into a discussion of values. Second, analysing the potential impacts can help to provide structured information about the quality of the proposal, initial assumptions and potential effects (indented or not intended, direct or indirect, etc). Third, the process offers the possibility to elaborate general or complementary alternatives to the policy proposal, thus contributing to a more rational and balanced policy-making. This policy proposal promoted the use of biomass fuel in transportation and was based on two EU Directives (2003/30/EC, 2003/96/EC). The screening process was conducted by the researchers during a meeting with civil servants from two different ministries. In total, four policy options were identified. A screening and scoping matrix was used to investigate possible direct and indirect economic, social and environmental impacts of the individual options. After this, a scoping and impact analysis was carried out. The conclusions of the research team that undertook the case study highlight that this policy proposal was an ideal example of carrying out an SIA, particularly by looking at the potential mid- and long-term economic, social and environmental impacts of using biomass in transportation. Second, during the SIA process it was considered as particularly difficult to identify relevant alternatives. The first five alternatives were seen as too restrictive. Third, it became apparent during the SIA that the horizontal integration issue of SD is of great importance, i.e. comparing objectives in different policy fields (like transport, climate, social exclusions, etc.) as defined in the NSDS. Finally, the research team experienced that a comprehensive SIA is a resource intensive task. They devoted about three person months only for the identification of likely impacts and the effectiveness of the policy proposal (Paredis, et al, 2006). Source: SIA – Screening Manual, 2006. Arbter, K. (2005) Nachhaltige Politiken und Rechtsakte: Studie zum international Stand der Dinge und zu einem Ablauf für Österreich (Endbericht zum Studienteil 1: Internationaler Stand der Dinge), Wien, Büro Abter. (In German, executive summary also in English). Arbter, K. (2003) “SEA and SIA – Two Participative Assessment Tools for Sustainability”, Paper presented at the EASY-ECO 2 Conference, Vienna, 15-17 May 2003, http://www.wu-wien.ac.at/inst/fsnu/easy2/papers/a2_arbter.pdf. ARE (Federal Office for Spatial Development) (2006) Nachhaltigkeitsbeurteilung des Sachplans Verkehr, Teil Programm, Schlussbericht, http://www.are.admin.ch/themen/raumplanung/00240/01406/index.html?lang=de. ARE (Federal Office for Spatial Development) (2004) Sustainability Assessment: Conceptual Framework and Basic Methodology, http://www.are.admin.ch/themen/nachhaltig/00270/index.html?lang=en. Bond, R. et al. (2001) “Integrated Impact Assessment for Sustainable Development: A Case Study Approach”, World Development, 6, pp. 1011-1024. Buselich, K. (2002) An Outline of Current Thinking on Sustainability Assessment, A background paper prepared for the Western Australian State Sustainability Strategy, http://www.sustainability.dpc.wa.gov.au/docs/BGPapers/KathrynBuselich.pdf. Dalal-Clayton, B. & Sadler, B. (2004) Sustainability Appraisal: A Review of International Experience and Practice, http://www.iied.org/Gov/spa/docs.html. Department of the Taoiseach (2005) Report on the Introduction of Regulatory Impact Analysis, Dublin, http://www.betterregulation.ie/attached_files/Pdfs/RIA%20english.pdf. Ecologic et al. (2007) Improving Assessment of the Environment in Impact Assessment, Final Report, Project No. ENV.G.1/FRA/2004/0081, http://www.ecologic-events.de/eu-impact-assessment/en/documents/Env_in_IA_final.pdf. EEAC (Network of European Environment and SD Advisory Councils) (2006) Impact Assessment of European Commission Policies: Achievements and Prospects, Statement of the EEAC Working Group on Governance, http://www.eeac-net.org/. European Commission (2006) Handbook for Trade Sustainability Impact Assessment, EC, External Trade, http://trade.ec.europa.eu/doclib/docs/2006/march/tradoc_127974.pdf. European Commission (2005a) Better Regulation for Growth and Jobs in the European Union, Communication from the Commission to the Council and the European Parliament, COM (2005) 97 final, http://europa.eu.int/eur-lex/lex/LexUriServ/site/en/com/2005/com2005_0097en01.pdf. European Commission (2005b) Common Actions for Growth and Employment: The Community Lisbon Programme, Communication from the Commission to the Council and the European Parliament, COM (2005) 330 final, http://ec.europa.eu/growthandjobs/pdf/COM2005_330_en.pdf. European Commission (2005c) Impact Assessment Guidelines, SEC (2005), 791, http://ec.europa.eu/governance/impact/docs/SEC2005_791_IA%20guidelines_annexes.pdf. European Commission (2004) Impact Assessment: Next Steps, Commission Staff Working Paper, http://ec.europa.eu/governance/impact/docs/key_docs/sec_2004_1377_en.pdf. European Commission (2002a) Communication from the Commission on Impact Assessment, COM(2002) 276 final. http://ec.europa.eu/governance/impact/docs/key_docs/com_2002_0276_en.pdf. European Commission (2001) European Governance: A White Paper, COM (2001) 428 final, http://eur-lex.europa.eu/LexUriServ/site/en/com/2001/com2001_0428en01.pdf. European Council (2006) Review of the EU Sustainable Development Strategy (EU SDS) – Renewed Strategy, 10917/06, http://sd-net/pdf/quarterly%20reports/EU_SDS_final_version_2006_June26_en.PDF. European Council (2001a) Presidency Conclusions – European Council Meeting in Laeken, 14-15 December 2001, http://ec.europa.eu/governance/impact/docs/key_docs/laeken_concl_en.pdf. European Council (2001b) Presidency Conclusions – Göteborg European Council, 15-16 June 2001, http://ec.europa.eu/governance/impact/docs/key_docs/goteborg_concl_en.pdf. IEEP (Institute for European Environmental Policy) (2004) Sustainable Development in the European Commission’s Integrated Impact Assessment for 2004, Final Report, IEEP, London. Paredis, E. et al. 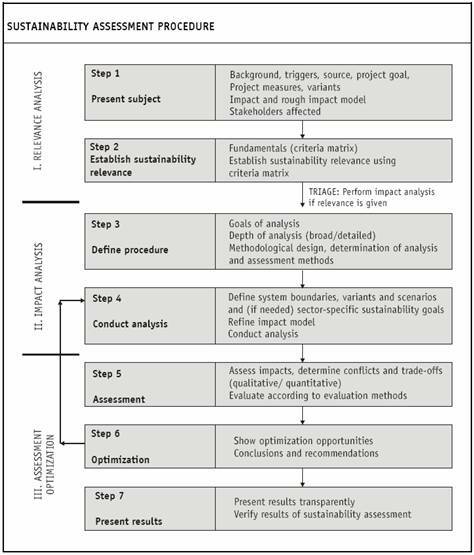 (2006) Methodology and Feasibility of Sustainability Impact Assessment. Case: Federal Policy-making Processes, Belgian Science Policy, Brussels, http://www.belspo.be/belspo/home/publ/pub_ostc/CPgen/rappCP46_en.pdf. Pope, J. (2003) “Sustainability Assessment: What is it and how do we do it”, Institute for Sustainability and Technology Policy, Murdoch University, Austrialia http://www.sustainability.dpc.wa.gov.au/conferences/refereed%20papers/Pope,J%20-%20paper.pdf. Pope, J. et al. (2004) “Conceptualising Sustainability Assessment”, Environmental Impact Assessment Review, 24, pp. 595-616. Renda, A. (2006) Impact Assessment in the EU: The State of the Art and the Art of the State, Centre for European Policy Studies, Brussels. Swiss Federal Council (2002) Sustainable Development Strategy 2002, Berne, http://www.are.admin.ch/themen/nachhaltig/00262/00528/index.html?lang=en. Tamborra, M. (2005) “Impact Assessment at the European Commission and the Contribution of EU Research”, Presentation at the EASY-ECO Conference, Manchester, UK, 15-17 June 2005, http://www.wu-wien.ac.at/inst/fsnu/manchester/presentations/tamborra.pdf. Wachter, D. (2006) “Nachhaltigkeitsbeurteilung: Erweiterung oder Konkurrenz zur Umweltprüfung?”, Paper presented at the UVP-Kongress, Paderborn, 14-15 September 2006. Wachter, D. (2005) “Sustainability Assessment in Switzerland: From Theory to Practice”, Presentation at the EASY-ECO Conference, Manchester, UK, 15-17 June 2005, http://www.wu-wien.ac.at/inst/fsnu/manchester/papers/Wachter.pdf. Weaver, P.M. & Rotmans, J. (2006) “Integrated Sustainability Assessment: What? Why? How?”, MATISSE Working Paper 1, http://www.matisse-project.net/projectcomm/uploads/tx_article/Working_Paper_1_03.pdf. Wilkinson, D. (2004) Impact Assessment, Policy brief for the EP Environment Committee, EP/IV/A/2003/09/01, http://www.europarl.europa.eu/comparl/envi/pdf/externalexpertise/ieep/impact_assessment_brief.pdf. 2 Additional information on SA in Switzerland was provided by Daniel Wachter from the Federal Office for Spatial Development (ARE). 3 Additional information on SIA in Belgium was received via email by Kristiaan Henrix from the Federal Planning Service Sustainable Development (PODDO).